The long awaited return of the nazi chef! 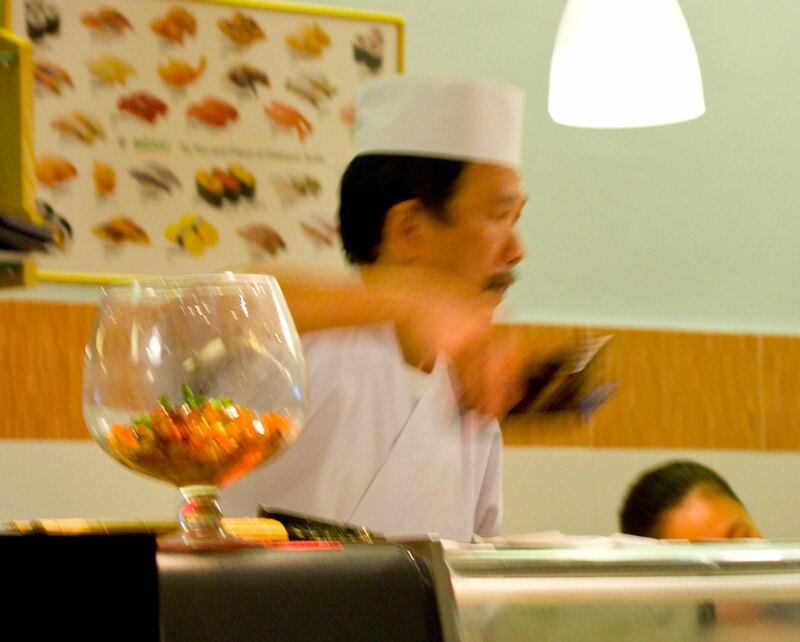 About 9 months back, this infamous chef closed down his eatery and retired, as I blogged about earlier. That’s when everyone found out that Wasabi Tei was actually a franchise and his eatery remained opened but taken over by some other people. As a result, the standard has dropped a lot, the portions are much smaller now, and the queues were no longer so long. Well to my surprise, this month there was a quiet buzz going around that ‘he‘ was back. 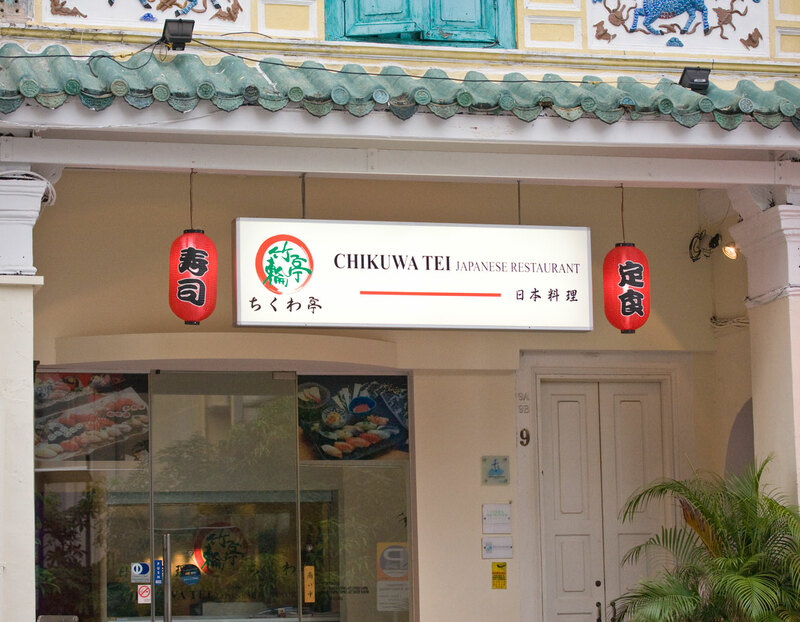 And indeed, the chef had just opened his own restaurant called Chikuwa Tei at the start of May. Now located at Mohamed Sultan Road, the interior space is much bigger although you can’t see it from my photo below. He has retained the counter with about 16 seats like the old one, plus 8-10 tables, each seating 4 persons. Some of the tables can be combined as well to form longer ones. The restaurant is itself is very spacious with a very tall ceiling. Complete opposite of Wasabi Tei! Chef Peter in action. Yes, now he finally has a name instead of just being “that nazi chef”! 😛 Blurry shot because I didn’t dare to point the camera at him too long. The fear of him is still instinctive hahaha! But he is much friendlier now, he actually jokes with the staff and smiles when he chit-chats with the customers! Can’t imagine it until you see it for yourself. First comes the otoshi. That means appetizer and is usually given free of charge. Back at Wasabi Tei he would give his trademark hijiki seaweed otoshi, which he still does give here but tonight we got this mini-oden style otoshi, which had braised chicken bits, stewed carrots, konnyaku and daikon. This has got to be my favourite chawanmushi in Singapore! 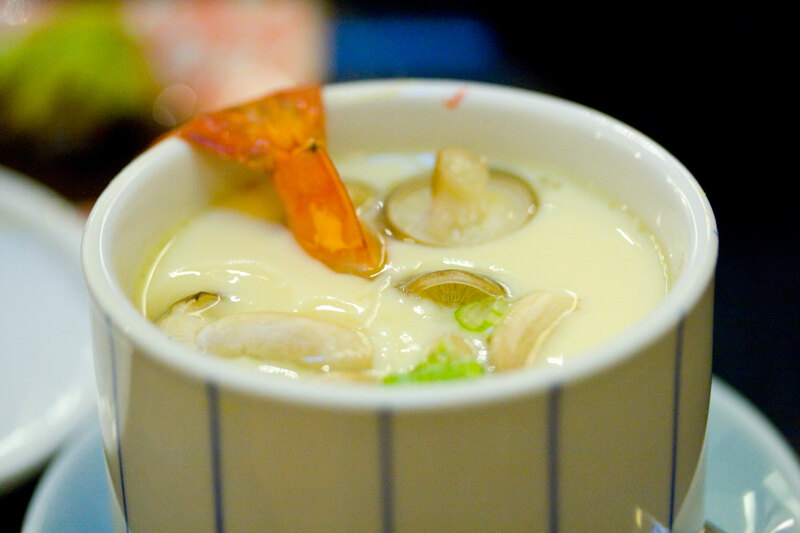 The egg custard is smooth and semi-watery, with a strong dashi taste to the broth used. But the real reason is because it is chock-full of ingredients! As you scoop it up, you can find shimeiji mushrooms, 1 crunchy prawn cut up into pieces, dashi-marinated chicken bits, 1 crabstick and glass noodles. The only thing I noticed is that the portion is a bit smaller now and there are less mushrooms. The chiraishi don set now comes in a circular bento box as opposed to the old rectangular one (which I actually prefer). Everything is the same however the price has increased by $5 but to make up for it, he has included 1 more type of sashimi. My mother ordered the taba nara teishoku set which is the classic codfish hotpot that so many Wasabi Tei customers loved to order. If I’m not wrong, the cod they use is the black cod instead of the normal one, and the flesh is also smoother. 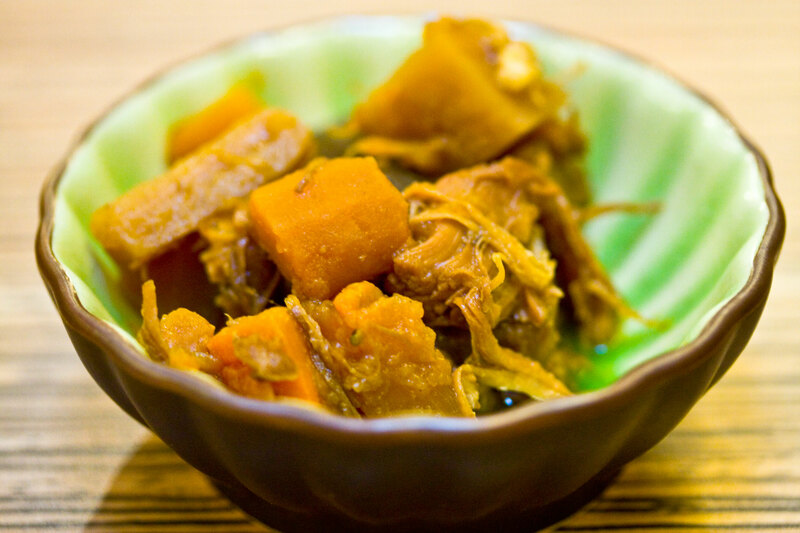 I actually never ate this dish before so I can’t say what’s different but it’s more or less the same as the old one. Perhaps more vegetables and a little less cod. Price has also increased by $6. My father ordered the unagi teishoku set. Same as before, just in a different plate. 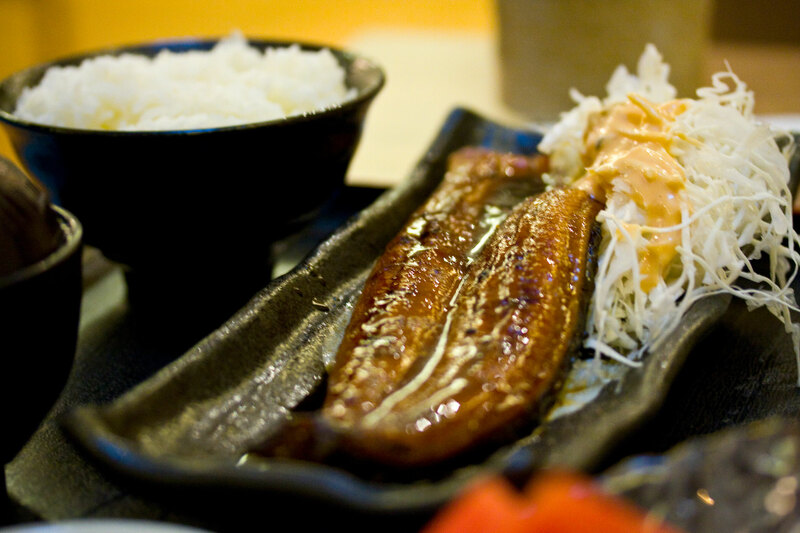 One thick slab of nicely grilled unagi with its special teriyaki sauce! Well I’m happy to report that “Wasabi Tei” has been resurrected! All the old favourites are back again and they taste exactly the same also. Chef has also added a lot more sashimi variety and cooked dishes to his menu because he has a much bigger kitchen with helpers inside as well. 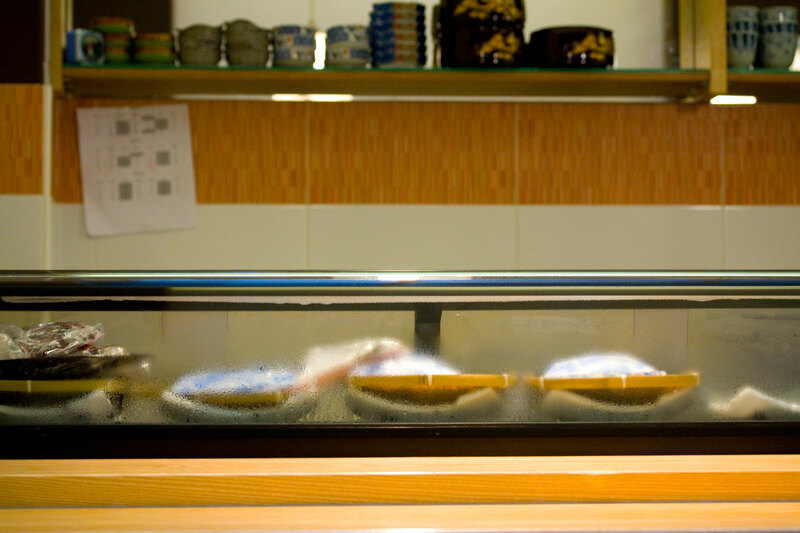 Prices have gone up about $5-10 on average, although some dishes like chawanmushi remained at the same price. The old $2 surcharge is gone and now replaced by the standard ++ for restaurants. 14 Responses to "Chikuwa Tei"
And still liked it. 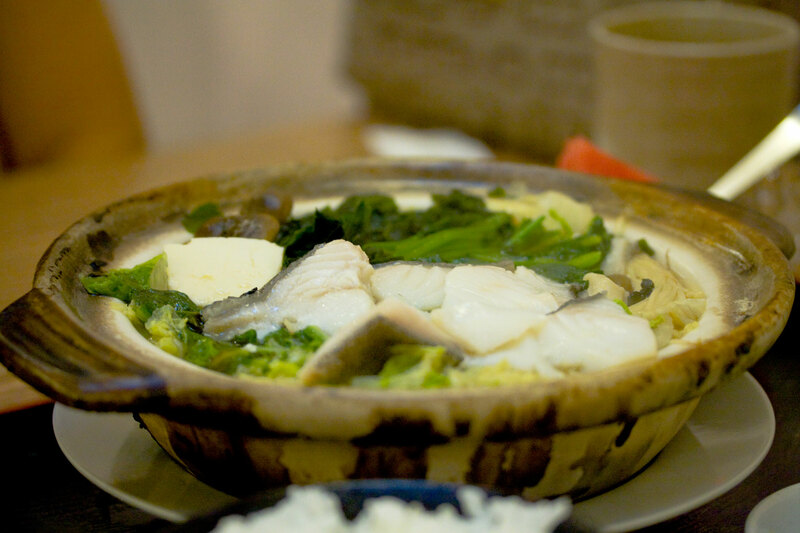 Your pictures are very well taken, especially the cod hotpot. 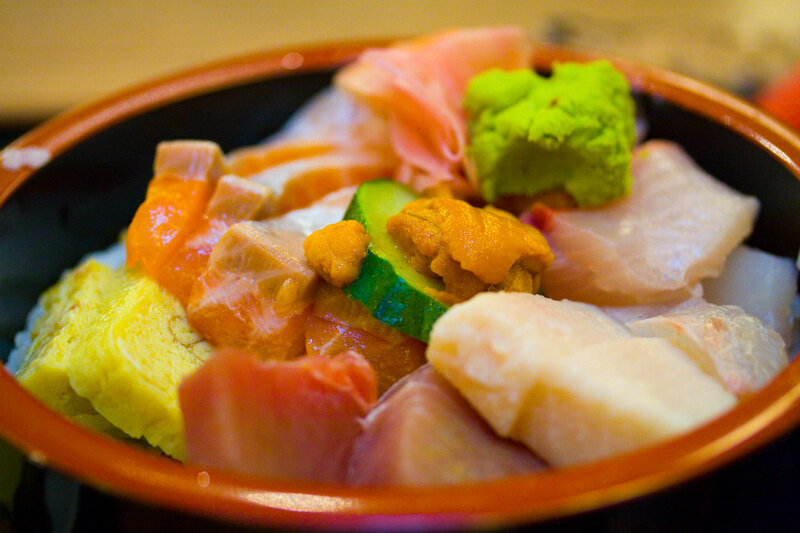 Cool – I never got to try the old Wasabi Tei though had heard a lot about it. Sounds like his new restaurant is huge! i think he is much happier cos he finally get a proper restaurant for himself and out of that cramp place. Hehe from what I’ve heard, he’s happier that now that he doesn’t need to implement those strict rules of the old Wasabi Tei which forced him to be such a nazi to customers. I went to Wasabi Tei before but haven’t have the chance to go to this new place because I live in Malaysia, but I know that it is really nice because the chef Peter is my uncle, haha. can check roughly how much you spent for the above food for 3pax? Hi, you’ll probably want to budget about a max of $25 per pax to be on the safe side as the set prices vary. Well I have to say I’m pretty amazed he has his own FB. Thanks for letting me know!